I don’t know how one is meant to go about quantifying how much one likes a record. I have always, often vehemently and profanely, objected to giving them marks out of ten, for instance (especially if decimal points are involved), and words are often inadequate, as anyone who’s tried their arm at writing about music knows. Maybe we should fall back to the list, another familiar tool that I dislike; but even if we do that, how do we determine what goes in first place, and what goes in second? It’s very rarely, in my experience, a clear-cut thing, and the dissonance between the arbitrariness of the choice and the potential authority of the reading of the choice is troublesome. Perhaps the best way, although it seems a little utilitarian as I type, is simply to judge it by how often you’ve listened to a record through choice? Not the “I want to get to know / get to grips with this” kind of choice, but the “I want to listen to something I really enjoy” kind of choice. 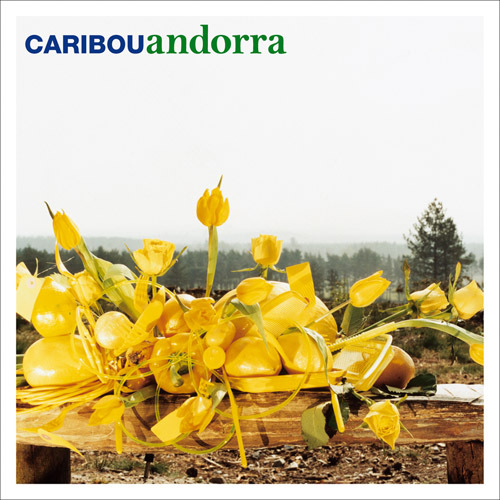 If we do use that as a metric, then Caribou’s fourth album, 2007’s Andorra, is maybe my favourite album of the last five years, because I honestly can’t think of another record I’ve played this much simply because of the pure pleasure of listening to it. I still think of and describe Caribou as a “laptop guy”, after the gentle glitches, burrs, and electronic jazz tones of his debut album, but Andorra, for the first seven tracks at least, sounds for all the world, at first impression, like it was recorded in 1967 rather than 2007. Influenced by The Beatles, The Beach Boys, and especially The Zombies (well, sounding like, if not necessarily influenced by – although I suspect so strongly! ), and touched with the familiar jazzy drum rolls and occasional brass touches that have characterised everything Caribou has released, it seems as if Dan Snaith has made an album of propulsive, groovy, gently psychedelic love songs rather than experimental laptronica. And he has, pretty much. But Andorra is an album of experimental laptronica, too. Because the final two tracks, and subsequent listens to the previous seven, reveal this to be very definitely a modern record, clearly indebted to electronic music and made almost certainly by one man (with the occasional guest vocalist) on his own, with a roomful of instruments and a computer full of software. There are various clues to the album’s electronic heritage and gestation; something in the impossible drum fills, the intricate layering of sound, the subtle noises that simply couldn’t emanate from a traditional “rock” instrument, and the complexity of the arrangements betrays that this isn’t mere 60s pastiche or homage. And then there’s the clattering, disintegrating, exhilarating, beatific electronica of the final track, Niobe, quite unlike anything else on the album, or anything that Snaith had released previously. It points towards where Caribou would go with Swim – deeper into electronic dance music, taking it right to the edge of chaos. I love Andorra, and listen to it, and Caribou in general, with an addict’s frequency. I love the songs; the opening lyric and riff of Sandy, the euphoric surges of Melody Day, the gentle soul of She’s The One. But I suppose, if I’m honest, I love the sound just as much, if not more; the way Eli descends into trippy, psychedelic bass and brass at the halfway mark, the tumbling discord and prettiness of Niobe, the delicious drum patterns of Sundialing. For me it’s both a warming emotional thrill and a delicious, aesthetic, sensual kick to listen to. Tom Listened: Caribou have always fallen into the ‘I should really check this out’ category of my music wishlist. I have seen their albums for sale on many occasions but have always opted to get something else instead, nearly making that purchase but never quite committing. I think the main reason for this is that I have owned Manitoba’s ‘Up in Flames’ for many years now and, whilst I liked it a whole lot to begin with, rarely go back to it these days. For me UIF is easy to admire but hard to love. the songs are spectacular, but I don’t really feel an emotional connection to the music. Obviously Dan Snaith has moved things on in terms of his sound since then and Andorra sounded amazing. Lush, rich and beautifully put together this is busy but uncluttered music that sounded wonderful on first acquaintance but will clearly reward repeat listens. I am keen to purchase it…time will tell whether it endures or goes the way of Up In Flames but I have a suspicion that the former outcome is the more likely in this case. Rob listened: I let Caribou’s ‘Swim’ burble by in the background a couple of times last year but found it hard to give full attention to. I know how highly Nick prizes these records and now I can hear why. Complex but without being oblique, there’s a whole world packed in here. It struck me as a minor wonder that Dan Snaith has used his laptop to create the sound of a real band so fiendishly layered and constructed that no real band could reproduce it, until Nick told us that on stage that’s exactly what him and his buddies do. Shows how much I knew about Caribou. Great write up. Caribou are one of those bands I never got round to giving any time to. Off to Spotify to rectify that….